Notes: Based on the manga by Nasu Yukie. Surviving the ordeals of infatuation, unrequited love, and the like is bad enough when one is a teenager, but for Kazuya Hasukawa, the problem is much worse than normal. His older brother has married Kazuya's first love, Suimei, and to add insult to injury, the two have decided to live in the same house as Kazuya! To save his sanity, Kazuya decides to move into a dorm at his prep school, Ryokuto Academy. However, it seems that misfortune is determined to follow Kazuya wherever he goes. The dorm he's assigned to live is Greenwood, infamous for the eccentric, quirky, or just plain crazy students that live within. Whether it's having to deal with the dorm president's constant attempts to "build Kazuya's character" (usually entailing some kind of psychological torment), the student body president's mobster sister, cute teenybopper ghosts, or simply trying to get over Suimei, Kazuya will have his hands full keeping both feet on the ground, not to mention his studies. Will Kazuya ever succeed in living a normal life ever again? 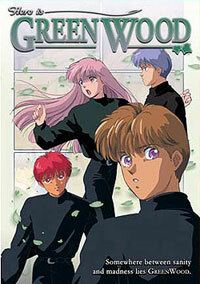 Here Is Greenwood, upon first glance, would seem to be just another high-school romantic comedy in the tradition of Maison Ikkoku, Kimagure Orange Road, and the like. However, one episode will quickly convince you that Greenwood is like no other comedy you'll ever see. To simply categorize Greenwood as "strange" would be unfair; however, there is a certain underlying pathos and eccentricity to this title that you'll be hard-pressed to find anywhere else. "Fresh and clever" are words Software Sculptors uses to describe this series, and for the most part, they're right. The art and animation are nothing particularly striking (typical anime style _highly_ reminiscent of other titles of its ilk), but the characters and storyline are. Kazuya is hapless and frazzled like the typical anime hero, but to a degree where you wonder how he managed to not accidentally fall out the window and break his neck dressing up in the morning. And his peers at Greenwood are equally exaggerated and odd, with quirks and curious pasts you'll only discover later as the series goes on. To Greenwood's credit, though, none of the character revelations come off as complete non-sequiturs. The characterization isn't quite perfect -- Kazuya comes off as a bit _too_ pathetic, the dorm president a bit _too_ cruel, Shun a bit _too_ cutesy -- but they're all people you can sympathize with and root for. The largest impression Greenwood brings across is that of a self-spoofing show highly versed in the art of understatement. Except for the last few episodes, Greenwood rarely takes itself too seriously, mocking itself in both the previews for upcoming episodes (which are a hoot) and in the episodes themselves. The episode premises are mostly low-key and quiet, not really aiming to rivet the viewer but to explore the weirdness of the characters; however, sometimes Greenwood succeeds _too_ well in this regard. An interesting episode will sometimes suddenly end, making you wonder just what the point was. Fortunately, the clever dialogue and hidden references to other titles (some more well-hidden than others) make each episode at the very least fun to watch. This anime won't win any awards anytime soon, but it _is_ a fun one, and one that's worth looking at if the local rental outlet has temporarily run out of your favorite title. There are a few flaws (the dubbed version is absolutely horrid, too), but they're relatively easy to overlook. Recommended Audience: For the most part, Here Is Greenwood is harmless fun, although there are a few references and innuendoes scattered throughout that might cause concern. Other than that, though, nothing objectionable.